One Forest Hill, looking south to the CN Tower. Unveiled this month, this 12-storey residence will bring new life to an infill site near St. Clair Avenue and Avenue Road. When developers seek out creative consultants for their projects, it's not often they find ones who also have deep, personal connections to the surrounding community. 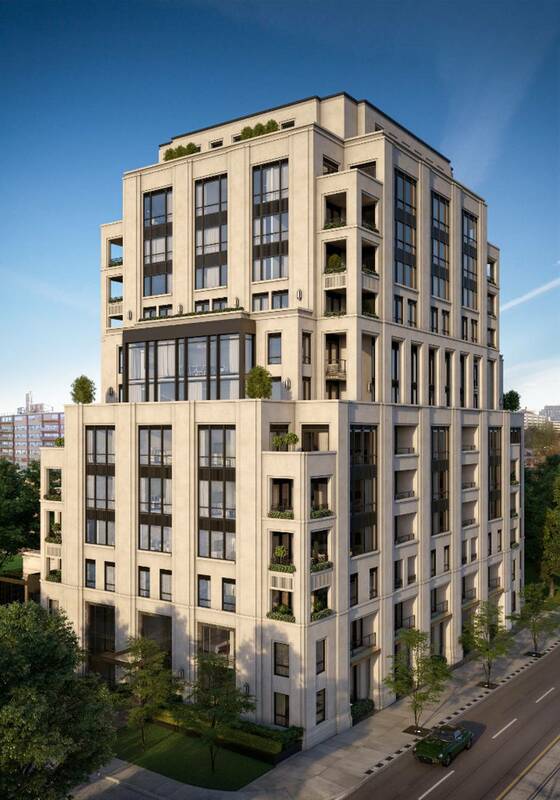 But in the case of North Drive's luxury development in Forest Hill, the company enlisted the talents of two locals: architect Richard Wengle and interior designer Brian Gluckstein. "Not only do they live in the neighbourhood, but they've grow up in the neighbourhood and the vast majority of their portfolio exists within walking distance of the neighbourhood, and they've collaborated on many of those project as well," said Jordan Morassutti, co-founder and partner of North Drive, which also teamed with the pair at 4 The Kingsway. "Brian and Richard are quintessentially Forest Hill, so it was a no brainer in terms of bringing them on board to style the building." Unveiled this month, this 12-storey residence will bring new life to an infill site near St. Clair Avenue and Avenue Road, which is close to the developer's office and a former high school. "It's an extraordinary address – 1 Forest Hill Rd. – arguably the best in the city," Mr. Morassutti said. "We have Forest Hill Road on the west side of the property and on the east is Glen Gould Park, so it feels as though it's a full city block, but without the hulking massing you typically see within a full city block." Amenities will include 24-hour concierge, valet parking and social spaces. To complement Tudor and Georgian-style homes in the historic neighbourhood, the façade will be fashioned with classic limestone, marble and bronze details. "I've got to tip my cap to Richard and Brian, they've done a fabulous job of pairing 1920s glamour and elegance with modern comforts in a very tailored and sophisticated design," Mr. Morassutti said. Inside, buyers can customize or combine the two- and three-bedroom units, which will average 2,250 square feet. "The vast majority of projects that are coming in the area – or have been built in the area – have smaller units on the lower floors, geared more towards investors, and more luxurious units as you move up the buildings," Mr. Morassutti said. All units will feature private outdoor spaces. "For this building, it's boutique in nature in that there are only 43 units and they're all of generous sizes. Within the plans, we have separate breakfast and dining areas, open and closed kitchens, both living and family rooms, his and her closets and ensuites." Another defining feature will be private outdoor space, from loggias roughly 11 by 12 feet to rooftop terraces for some penthouses. "It's exceptionally rare," Mr. Morassutti said of the latter. "There's an arcaded design so that you have partial covered space and unobstructed space." Units will average 2,250 square feet. But whether inside or out, each unit will benefit from the site's position 150 metres above sea level. "The views you have at One Forest Hill on the third floor are akin to what you'd see on the 15th floor of our project in Yorkville, it's quite dramatic," Mr. Morassutti said. Common amenities and services will be lavished with 24-hour concierge, valet parking, fitness and social spaces. "We have two separate lounge spaces that act as a natural extension of the lobby but can be closed off for private events," Mr. Morassutti said. Units will include locker and two parking spots. Occupancy will begin by fall, 2020.